There are many different things to consider when choosing window treatments for your home and two of the most important are how much natural light you want in a room and how much privacy you want. With warm weather just around the corner, it’s very tempting to open up your vinyl windows and enjoy the fresh air and sunshine. Even if you don’t actually have your windows open, it can still be nice to enjoy the extra sunlight. It’s only natural to want to feel connected to the outside world and it’s nice to not have to rely on electrical lights as much. But it’s also important to still have some level of privacy, too. If you want window treatments which let you control both how much privacy and how much light you get, these types window treatments may be just what you want. If you want a high level of control over the amount of light and privacy you have in a room at any given time, blinds and shutters are your best bet. Both can easily be adjusted to let in lots of light during the day, but allow for complete privacy when you need it. Both are available in so many different styles and colors, you can easily find something which looks great with your home’s decor. Curtains and shades made of dark, heavy materials are great for the winter, but once spring comes around, you might want to consider trading them out for something more sheer. Not only do they let in more light, they have a nice airy look which is perfect for the warmer seasons of the year. If you’re on a tight budget, one option you might want to consider are frosted window films. There are many different types of window films on the market, but many of the most popular ones emulate the look of different styles of glass. Frosted glass allows some natural light in, but allows you to have some privacy. Window films are generally very inexpensive and easy to install. All you have to do is buy the film, cut it to the size of your window pane, and apply the film to the pane. 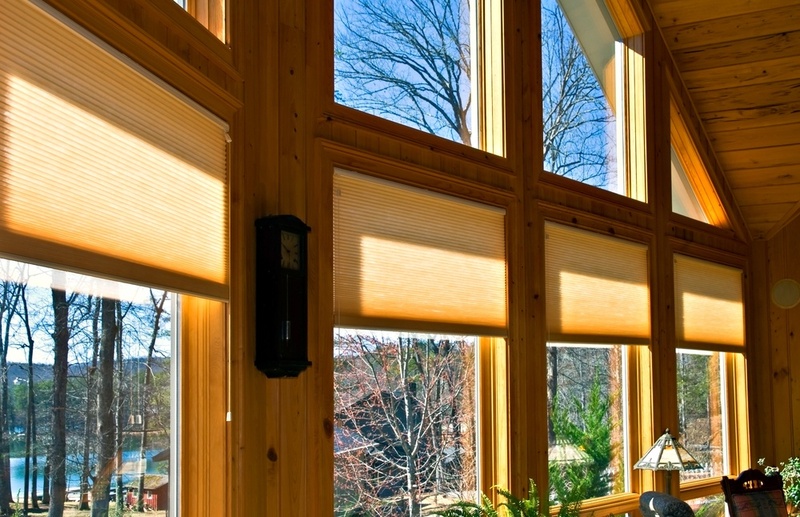 Solar screens are another type of window treatment that allows you to have it all. They allow natural light to come through, but they prevent too much light from coming in so you have fewer problems with glare. They also filter out all the things you don’t necessarily want coming into your home, like harmful UV rays. They even help block excessive heat from the sun, so you might not have to run the air conditioner as much during the summer. Even better, even when the shades are down, they don’t fully obstruct your view the way blinds, shutters, or curtains would.